It seems I’ve become a master of absentee blogging – and by that, I just mean that I’m really good at neglecting things. Sorry. I was busy, and now I’m lazy and self-conscious. But disregard that, because it isn’t why I’m writing this post. I’m writing this post because of school. I’m currently in a class where I have to create my own journalistic startup company (for any of you in Grady, it’s called Entreprenurial Journalism with Greenman, and I give it as many thumbs up emojis as my phone could fit into a text message or tweet or something), and I’ve got a good idea. A good one. And I’m currently in the phase of my product where I’m developing my audience (and I don’t think linearly, so I’m also thinking about potential advertisers and establishments I would feature on my site) and seeing if anybody would actually use my site. My idea is something I like to call Townie Travels. 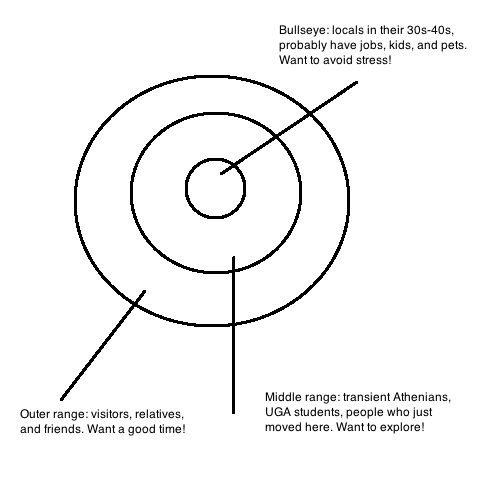 Townie Travels is going to be an Athens travel site that is specific in that it will cover all of the neighborhoods here (unless I decide to skimp out on Watkinsville and Bogart, I need input on that). Why should you care or show any interest? Because Athens isn’t just UGA or downtown – it’s a whole city. There are over 116,000 people here, and a lot of those people aren’t students. There are things happening besides shows or little craft fairs downtown (not that those aren’t great and won’t be covered). However, if those things aren’t going on in your neighborhood, you probably don’t know about them. Look at Flagpole – they post tons of event previews every week, but you’re primarily reading about things going on downtown. This is where Townie Travels would come in. Athens is more than one neighborhood, and people should be able to experience that. Visitors – parents, sisters, cousins, brothers, friends, colleagues, pen pals, grandparents, high school classmates, in-laws – are my final target audience. How does this apply to you? Well, you’ll probably have a visitor during your time here. What if your grandparents are visiting and you want to take them to lunch? Townie Travels could recommend a restaurant that’s not too far away for you. Less distance, less hassle. Or maybe you’re wondering about how I’d make money. Well, I’ve thought about that too. I’d aim for advertisements for local businesses (oh yeah – Athens is also unique in that its passion for local business is really strong, and you can bet I’ll feature them on my site), and have a donate button somewhere for anyone who’s feeling generous. But I also have some other ideas, like raffles and wristbands. Users could pay a dollar for a drawing for something like a ticket to a local concert or gift card to a local shop. Or they could buy a wristband for a little restaurant tour or bar crawl itinerary I’d set up, and customers with a wristband would get a discount. As you can see, I’ve thought about this startup a lot. So, why on earth would project this be problematic? My mind is exploding with ideas all the time. My thoughts aren’t really linear or fluid unless I’ve had a lot of iced coffee. Seriously, right now I’m working on three different paragraphs at the same time. So I miss things, or lots of my ideas don’t fully develop. This is where I need you. I need you to tell me what you think. Yeah, it would be awesome if you like my idea, but if something is bothering you, I want to know about it. Criticize me! Tell me my thought process is scribbly! Tell me how I could improve! Give me suggestions! This startup isn’t about me, it’s about Athens, and there’s a chance it’s about you.